One of the easiest ways to get to and around Brooklyn is to catch the Gray Line Hop-On, Hop-Off Brooklyn Tour! The double decker bus takes customers to must-see Brooklyn attractions and your ticket is good for 24 hours. The Brooklyn Bridge was very high on my ‘Things to do in Brooklyn’ bucket list! It’s size and structure will remind you of the city’s architectural and engineering prowess. 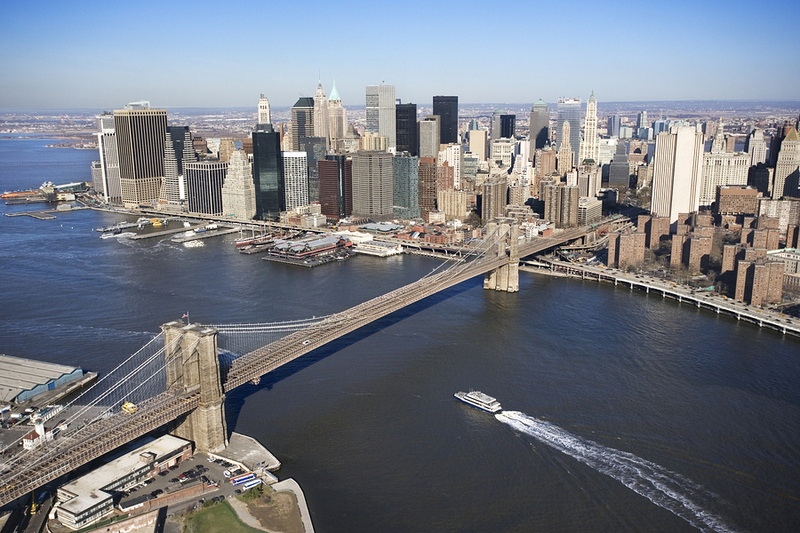 From the bridge, you’re bound to see the iconic views of lower Manhattan, the waterfront and the Statue of Liberty! It’s also a fabulous backdrop for a selfie! Down in DUMBO, you’ll find the Brooklyn Bridge Park! From here you can find a fabulous picnic spot to enjoy the local food and soak in the amazing views of Manhattan! The park’s Pier 1 area has open lawns, a promenade and seating area at the river-front. If you are visiting with children, then there’s also a fantastic playground at Pier 6 and Jane’s Carousel. Stop off at the Brooklyn Botanic Garden to find 52 acres of peace and calm. It’s home to a number of unusual and themed gardens. There’s the first Japanese styled garden in the US, a Shakespearean themed garden and a romantic esplanade of beautiful cherry trees. The garden offers seasonal tours each day from Tuesday to Sunday. Visit bbg.org/visit if you would like to plan ahead. 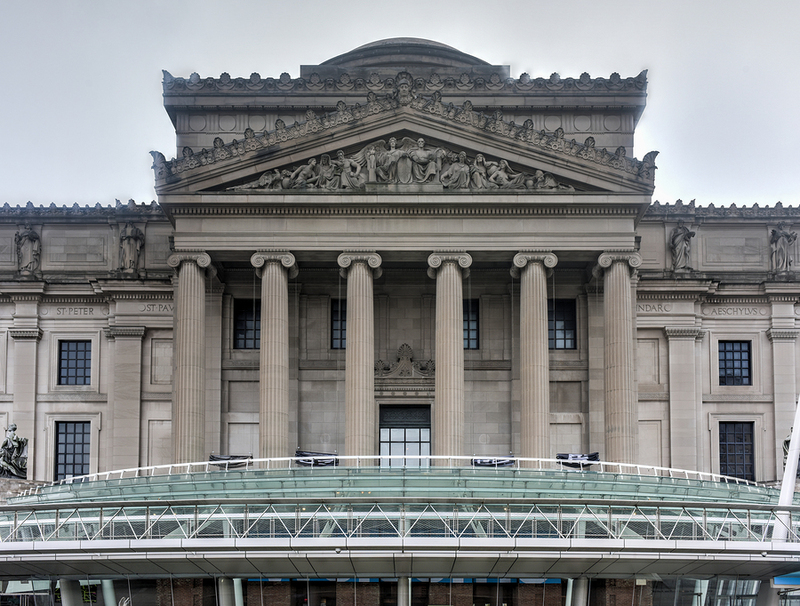 Next to the Brooklyn Botanic Garden, you will find the Brooklyn Museum – which is also serviced by a stop on the Hop-On, Hop-Off Tour. Situated in Prospect Heights, it’s a vast, beautiful building packed with a diverse, permanent collection from European masterpieces, Ancient Egyptian artifacts, African art, modern art and cutting edge exhibitions. The Brooklyn Historical Society was on my ‘Things to do in Brooklyn’ bucket list and it didn’t disappoint! It’s located near the Brooklyn Tour stop at Fulton Mall. This nationally recognised history centre preserves Brooklyn’s 400-year history. Visit brooklynhistory.org to find out about what they will be exhibiting during your visit! Hop-Off at Cadman Plaza and Williamsburg’s Grand Army Plaza! At Grand Army Plaza, there are the Soldiers’ and Sailors’ Arch, John F Kennedy memorial and several civil war memorials. You can also see the world War II Memorial at Cadman Plaza. Brooklyn’s music scene is overflowing! If you are short on time, then check out the Brooklyn Academy of Music – a not-for-profit performing and cinematic organisation which offers 200 or more performances per year and a further 75 free performances per annum. There’s also Bargemusic in Brooklyn’s DUMBO area! It’s a classical music venue located on a barge in the river offering fabulous performances. DUMBO is also home to St Ann’s Warehouse - known for its eclectic music and theatrical productions. Bowie, Lou Reed and Marianne Faithful are just a few of the notable names who’ve performed there. You’re really spoiled for choice when it comes to food and drink in Brooklyn. There are too many to list – but I loved the Brooklyn Brewery in Williamsburg (near the Hop-On, Hop-Off stop at Grand Army Plaza). This is the home of Brooklyn Lager. It’s based in an old warehouse district that is now a cultural destination. Check out their website brooklynbrewery.com if you want to book at tour! Cheesecake is a culinary symbol of NYC and Brooklyn is its spiritual home. I think it would be rude to go home without trying some – and Junior’s Restaurant and Bakery is the best place for it! Watch the sunset from Sunset Park – a hidden gem of green space nestled inside the Sunset Park neighbourhood. From the highest point, you’ll be able to see the Statue of Liberty, the skyline of Manhattan and survey Brooklyn itself! Afterwards, you can experience this diverse neighbourhood’s awesome array of restaurants – there’s literally something for everyone! Ride on beautiful antique Carousel in Brooklyn Bridge Park. Jane’s Carousel is a famous antique carousel that dates from 1922. Its 48 horses are housed in a glass box, safe from the elements, allowing you to take advantage of this beautiful attraction the whole year round! Head south to Brooklyn’s Coney Island! It is home to the famous Cyclone – a wooden roller coaster, Luna Park Amusements, Atlantic beaches, a world famous boardwalk and the New York City Aquarium. It feels hard to believe you are still in Brooklyn and indeed, NYC. It’s hard to do the area justice in any itinerary as it is such a thriving and diverse area of the city. With all of these things to do in Brooklyn, it is definitely a place worth visiting! Gray Line New York’s Hop-On, Hop-Off Double Decker Brooklyn Bus Tour is the most flexible way to see the district.